In a statement issued on Friday, Oracle announced that it intends to discontinue commercial development of the OpenOffice.org (OOo) office suite. The move comes several months after key members of the OOo community and a number of major corporate contributors forked OOo to create a vendor-neutral alternative. OOo is one of many open source software projects that Oracle obtained in its acquisition of Sun. OOo has long been plagued by governance issues and friction between its corporate stakeholders. Sun’s copyright assignment policies and bureaucratic code review process significantly hindered community participation in the project. Oracle declined to address these issues after its acquisition of Sun and exacerbated the friction by failing to engage with the OOo community in a transparent and open way. The LibreOffice escape from Oracle is a powerful demonstration of how open source forking can be used to protect community autonomy and lock out exploitative stakeholders. You might be tempted to applaud. You shouldn’t. We would all be better off if Oracle had participated in the OpenOffice project in a transparent and open way. Users would be better off, because Oracle brings a lot to the table, and Oracle would be better off, because they would have a foundation for their commercial Cloud Office project (which appears to have been terminated along with their participation in OpenOffice). So, we all lose here, in the short term. However, in the long term, the project continues, under better conditions that Oracle permitted, and we all benefit from that. It’s just a shame that Oracle was so short-sighted. Hexographer and Dungeonographer received major updates a week or two ago. If you’ve used either tool since then, you’ve probably noticed the changes. Both tools received layout changes which reduced the number of menu items by placing buttons for many of those features in panels dedicated to those features. For example, the ability to add custom map items is now a button on the map items tab/toolbox. There were a great many other changes, as well. You can read more about it at the Inkwell Ideas web site. It costs money ($10, as of this moment, but it’s usually $15). Some disappointing news from the Ninth Circuit Court. The exclusive distribution right is limited by the first sale doctrine, an affirmative defense to copyright infringement that allows owners of copies of copyrighted works to resell those copies. The exclusive reproduction right is limited within the software context by the essential step defense, another affirmative defense to copyright infringement that is discussed further infra. Both of these affirmative defenses are unavailable to those who are only licensed to use their copies of copyrighted works. A fair bit of a fuss is being made over the restrictions imposed by this interpretation of the applicability of the first sale doctrine. Wired offers an article that focuses quite a bit of attention on the subject: Guess What, You Don’t Own That Software You Bought. The author of Hexographer, Joe, has revised the “lifetime” license of Hexographer so that it no longer self-destructs after one year. The flaws in the “free” and “one year” versions remain, however, so those should be avoided. However, if you like the software and feel it is worth paying for (and it certainly does seem worth paying for), the “lifetime license” now appears to be what it says it is: a lifetime license. I have updated my original Hexographer article to reflect the revised license terms. I also bought the software. New Zealand’s parliament is preparing to vote on a major patent reform bill that will tighten the country’s standards of patentability. One of the most significant changes in the proposed bill is a specific patentability exclusion for software. If the bill receives parliamentary approval in its current form, it will broadly eliminate conventional software patents in New Zealand. Never content to twist US law into pretzels, the media robber barons also attempt to use their power to make other nation’s laws as bad as those we have here…. In accordance with US trade law, the Office of the US Trade Representative (USTR) is required to conduct an annual review of the status of foreign intellectual property laws. This review, which is referred to as Special 301, is typically used to denounce countries that have less restrictive copyright policies than the United States. The review process is increasingly dominated by content industry lobbyists who want to subvert US trade policy and make it more favorable to their own interests. […] One of the organizations that plays a key role in influencing the Special 301 review is the International Intellectual Property Alliance (IIPA), a powerful coalition that includes the RIAA, the MPAA, and the Business Software Alliance (BSA). The IIPA, which recently published its official recommendations to the USTR for the 2010 edition of the 301 review, has managed to achieve a whole new level of absurdity. University of Edinburgh law lecturer Andres Guadamuz wrote a blog entry this week highlighting some particularly troubling aspects of the IIPA’s 301 recommendations. The organization has condemned Indonesia and several other countries for encouraging government adoption of open source software. According to the IIPA, official government endorsements of open source software create “trade barriers” and restrict “equitable market access” for software companies. The Indonesian government issued a statement in 2009 informing municipal governments that they had to stop using pirated software. The statement said that government agencies must either purchase legally licensed commercial software or switch to free and open source alternatives in order to comply with copyright law. This attempt by Indonesia to promote legal software procurement processes by endorsing the viability of open source software has apparently angered the IIPA. The number of ways in which the IIPA’s statements regarding open source software are egregiously misleading and dishonest are too numerous to count. OpenOffice.org 3.2 is now available, with a handful of new features and improved ODF compatibility. If you haven’t migrated from MS Office to OpenOffice… what are you waiting for? Hello? It’s 2010! I recently encountered a mapping program intended for role-playing games, called Hexographer. It is an easy to use application that makes colorful game maps. There is a “free” version (not free as in speech — free as in beer), and a pay version. The free version is pretty nifty. However, if you use Hexographer, I do not recommend that you rely on the “free” version. The online (free) version is a Java app. Under ordinary circumstances, you can simply download a Java app like this, and run it on your own computer. Why would you want to do this? Because web sites go down. They go away. (Remember Ar-Kelaan Hexmapper? Their Hexmapper software is available elsewhere, but the Ar-Kelaan site itself is no more.) It is a fact of life. If you want to be able to open your maps a few months from now, it is important that you be able to run the app locally. Unfortunately, the author of Hexographer has written the “free” app so that it can only be run on his server. P.S. 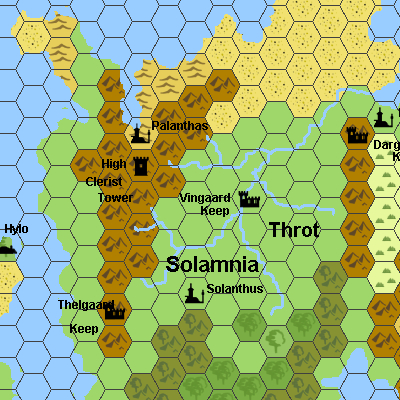 The Welsh Piper has a nifty article on using hex maps to facilitate world building. Check it out. If you are considering migrating from another office productivity suite to OpenOffice (and if you are not considering that, you should), check out this Sun Microsystems on-demand webinar: tips and strategies for moving to OpenOffice.org.